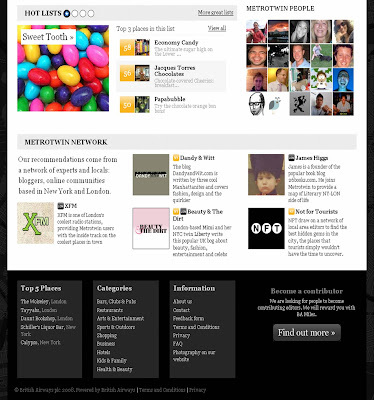 BA MetroTwin (http://www.metrotwin.com) is a new social network that is about to go public. 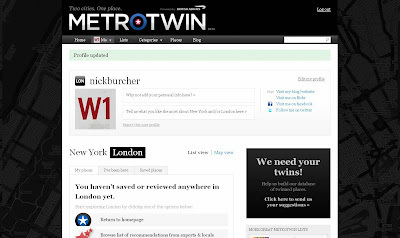 Put together by British Airways, MetroTwin aims to 'twin' New York and London and create a recommendation based social network around the 2 cities. To date the Metrotwin network has been by invite only with full public launch due at the end of September. I was lucky enough to receive an advance Metrotwin invite recently, so I thought I would have a look around before it is open to everyone! The first thing you do is setup your own profile page. Getting up and running is quick and easy to do and you can come back later to fill in the answers to questions like 'why do you love London / New York?' The profile also gives you the opportunity to include information about your other social presences on the net, allowing you to fill in details about your blog / Facebook / Flickr / Twitter, and then includes links to these on your profile page. After this Metrotwin users can fill in their own recommendations or immediately start exploring Metrotwin user recommendations for New York / London hotels, shops, bars and nightlife. Metrotwin recommendations are presented in both lists and categories around all topics. 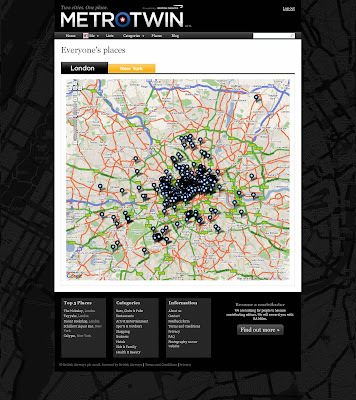 Metrotwin contributors also have the chance to 'twin' things, thus linking similar locations between the cities. Metrotwin users can also find London / New York recommendations through an area that uses a Google map type mashup to present results. 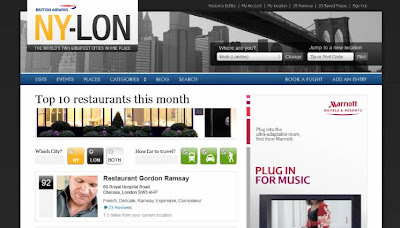 According to the blog on the MetroTwin site, Ny-Lon, was due to be the name for the site, but MetroTwin was adopted to prevent any copyright issues. I really like Metrotwin. 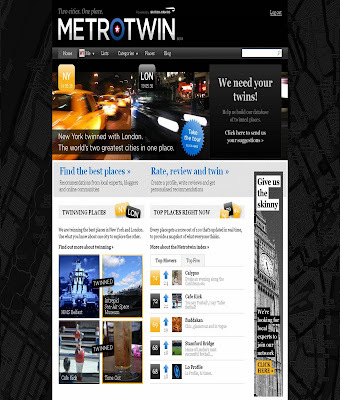 I think the Metrotwin site has a pleasing design, excellent usability and will be an invaluable source of information about both London and New York. 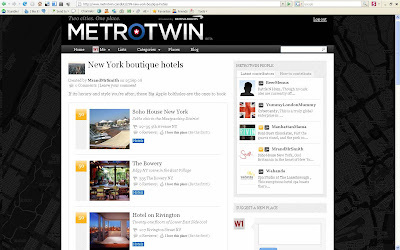 Metrotwin is a great example of the growing trend for niche social networks. Rather than try to be an 'all things to all' travel site, it focuses solely on the 2 cities and does an excellent job of bringing them to life. The discreet British Airways sponsorship sits comfortably and I think the whole site is well designed and well put together. Will be interesting to see how Metrotwin evolves once it is open to everyone! I agree that it will be interesting to see how Metrotwin develops and grows. The potential for success really seems to be there. At FreshNetworks we work with a number of travel brands and what really works for them is to create a way to extend the customer's experience beyond isolated trips. Metrotwin seems to have some real benefits for users and so could work here. I don't think anyone who starts a community ever knows what particular combination of features makes it successful. 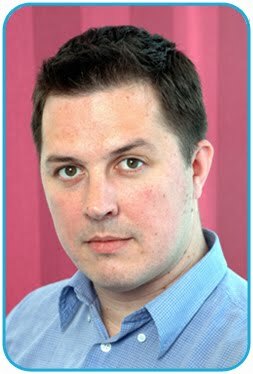 However, creating it in a way that allows it evolve rather than be just one thing at launch is a major factor. The current use and future plans around lists promises to create patterns of use no one can predict as described by IBM's ground breaking research. I think that the beauty of Metrotwin is that its mission is to do one thing well (London / New York information), but has the scope to evolve around this - as ixtlan says this a key attribute. I agree Matt, it also works well as a way of extending the experience - BA are not just flying you between 2 destinations, but are helping customers do more in each place - whilst encouraging those that aren't BA passengers to consider the brand positively for the future. The Metrotwin blog acknowledges that it has already changed from the original plan (new name and new functionality) and will continue to evolve as time goes on. The main thing is that it is a site that people will want to go to, and the more people that visit, the more use Metrotwin will be.